Por especial encargo de nuestra institución miembro en España el Instituto de Crédito Oficial (ICO), nos es grato transmitirle el recordatorio a participar en el VI Programa Internacional de Formación de Directivos de Instituciones Financieras que organiza el ICO junto a IE Business School, y se realizará en Madrid, España, del 12 al 14 de noviembre de 2018. En el mensaje abajo podrá acceder a las informaciones del Programa. 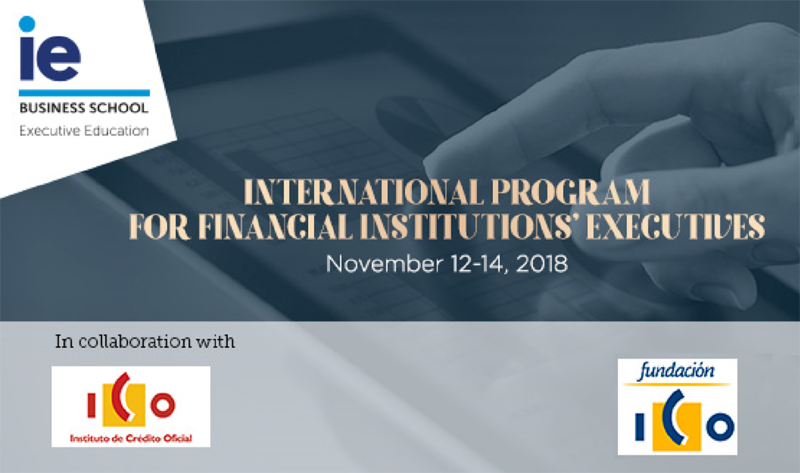 Please find here the agenda and brochure for the VI International Program for Financial Institutions’ Executives that the prestigious IE Business School organizes with the sponsorship of ICO and ICO Foundation. The course will take place on the main campus of IE Business School in Madrid, in November 12-14. Our positive experience over the last 5 years means that we firmly believe in the value of this course both as a meeting place and as an opportunity to discuss our common challenges as public financial institutions. In this edition we have carefully tailored a program with updated and highly relevant content and high-profile speakers, which we hope will appeal to you. We encourage you to sign up for the course as early as possible since we may run out of places! As always, you will benefit from the support of ICO Foundation, which allows you to enjoy this high quality event for a very symbolic cost of just 700€. We also encourage you to share this information with your colleagues in your institution, in case you could not attend or deem it convenient.